We integrate the coupled climate model ECHAM5/MPIOM to equilibrium under atmospheric CO2 quadrupling. The equilibrium global-mean surface-temperature change is 10.8 K. The surface equilibrates within about 1,200 years, the deep ocean within 5,000 years. The impact of the deep ocean on the equilibrium surface-temperature response is illustrated by the difference between ECHAM5/MPIOM and ECHAM5 coupled with slab ocean model (ECHAM5/SOM). The equilibrium global-mean surface temperature response is 11.1 K in ECHAM5/SOM and is thus 0.3 K higher than in ECHAM5/MPIOM. ECHAM5/MPIOM shows less warming over the northern-hemisphere mid and high latitudes, but larger warming over the tropical ocean and especially over the southern-hemisphere high latitudes. ECHAM5/MPIOM shows similar polar amplification in both the Arctic and the Antarctic, in contrast to ECHAM5/SOM, which shows stronger polar amplification in the northern hemisphere. The southern polar warming in ECHAM5/MPIOM is greatly delayed by Antarctic deep-ocean warming due to convective and isopycnal mixing. The equilibrium ocean temperature warming under CO2 quadrupling is around 8.0 K and is near-uniform with depth. The global-mean steric sea-level rise is 5.8 m in equilibrium; of this, 2.3 m are due to the deep-ocean warming after the surface temperature has almost equilibrated. This result suggests that the surface temperature change is a poor predictor for steric sea-level change in the long term. The effective climate response method described in Gregory et al. 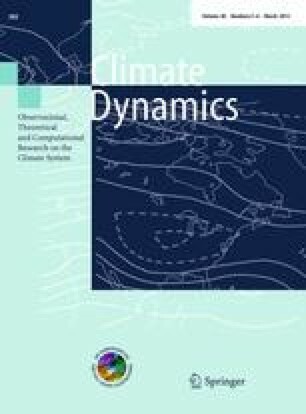 (2004) is evaluated with our simulation, which shows that their method to estimate the equilibrium climate response is accurate to within 10 %. We thank Dr. Helmuth Haak for his assistance in setting up the experiment and for providing the pre-industrial control simulation. We thank Dr. Malte Heinemann for discussions and suggestions on the ozone adaptation and negative optical thickness problems. We thank Dr. Hongmei Li and Mr. Peter Dueben for discussions and improving the language of the paper. We thank Dr. Aiko Voigt for providing the codes to calculate the ocean heat transport. We appreciated the careful and constructive comments from the anonymous reviewers. The model simulations were carried out on the supercomputing system of the German Climate Computation Center (DKRZ) in Hamburg.